Starting early 2016, I will be detailing all known instruments to date. I will provide as much background for each instrument as possible, including historical details and photos as they are made available. I will also occasionally be featuring owners and their instruments, especially those with interesting stories attached. If your Butterfly Grand has it's original soundboard, the serial number can be located on the leading edge of the soundboard near the treble bridge strut relief. Another interesting note on serial numbers. 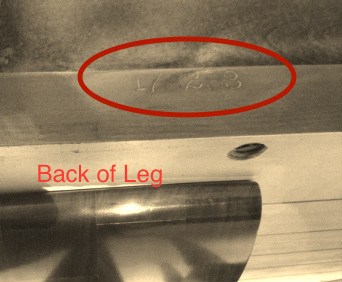 The legs and pedal lyre both have the last three digits of the piano serial number stamped on them. The leg stamping is located on the bottom of the mounting flange along with the leg number, either 1, 2, or 3.